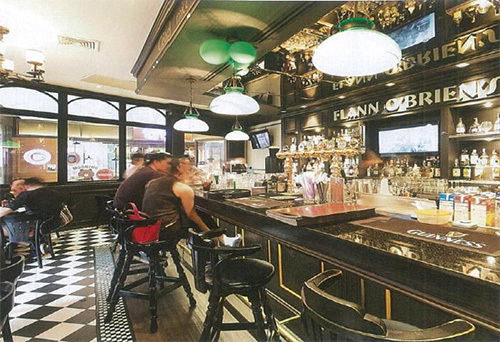 It’s me: A traditional Irish pub in the best location in Thonglor area, with the friendly environment along with its slogan, “No Stranger at Flann O’Brien’s, just friends you haven’t met yet” Touch me: The color most will be in green to align with Irish and St.Patrick’s Day, the day when Irish people will wear green costume. There is indoor and outdoor zone, with the counter bar inside full with liquor. Outside is decorated with fake glass giving the feeling of dining and drinking in Ireland. Try me: All dishes were cooked with the traditional recipe, starting off with Caesar Salad with Shrimps mixed with Parmesan cheese, Croutons, bacon, and egg. Follow by New Zealand Lamb chop, add up the taste with Garlic, rosemary and top with gravy sauce and served with mashed potato. For appetizer, we recommended Fish & chips and Banger and Mash, an original pork sausage. The last is the restaurant recommended dessert, Irish Bread Pudding from Group restaurant. Pay me: Average of 500 Baht Find me: Eight Thonglor Building, 88/1 Sukhumvit 55( Thonglor) Open from 10.00 – 01.00 hrs. Tel.